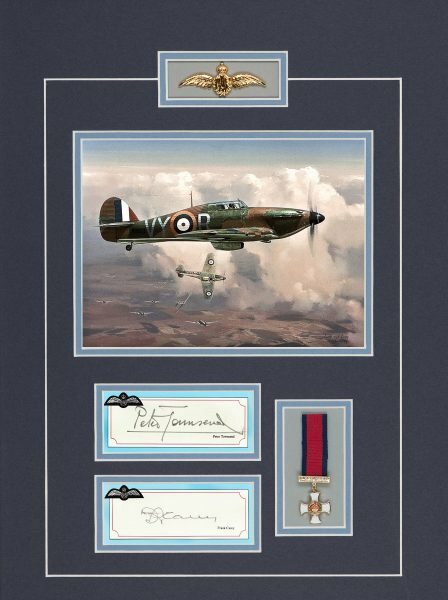 Two highly decorated and distinguished fighter pilots both of whom became synonymous with the Hurricane during and after the Battle of Britain. Frank Carey flew Hurricanes almost throughout the war, Peter Townsend commanded 85 Sqn through the Battle and formed the first Hurricane night fighter squadron in the Blitz. Frank Carey became the most highly decorated Hurricane fighter pilot of WWII, flying before, during and after the Battle of Britain in which he often flew as many as six operational sorties a day. Later transferring to the Far East he led the Hurricane wing in Rangoon. 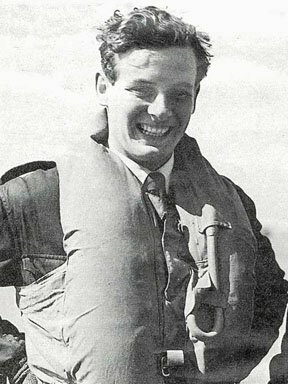 Peter Townsend commanded 85 Sqn’s Hurricanes for more than a year from May 1940, first as a day fighter squadron, then as the first night fighter squadron during the Blitz of London. After many other commands he became Equerry to King George VI in 1944. GROUP CAPTAIN PETER TOWNSEND BIOGRAPHY"
My maiden flight was in a Bristol fighter in 1928 at Old Sarum where Sqn. Ldr. Leigh Mallory commanded an A-C Squadron. I later went to Cranwell, going solo in an Avro Tutor in September 1933. I graduated to Fighter Training flight, flying Bristol Bulldogs, was commissioned in 1935, and posted to No 1 Fighter Squadron at Tangmere to fly Hawker Furies. When the Abyssinian crisis broke in 1936 I was posted to No 36 Torpedo Bomber Squadron in Singapore for reinforcement duties. Returning to U.K. in 1937 I was ‘grabbed’ by Coastal Command because of my navigational experience, but in 1938 wangled my way back into Fighter Command, as a Flight Commander on 43 Squadron. In the Autumn our Hawker Furies were replaced with Hurricanes. Soon after the outbreak of war, 43 Squadron was moved to Acklington to perform convoy patrol duties, and on February 3rd 1940, leading ‘B’ Flight, we shot down an He 111, the first German to crash on English soil since WWI. Later that month I claimed my first solo victory, an He 111 which I shot-down at 20,000 ft. Both his wings were shorn off in his “death dive”. I brought down another He 111 in April, and was promoted to lead 85 Fighter Squadron in May 1940. I had further combats against Dornier aircraft during the Spring and by mid-Summer the Squadron was becoming more and more intensively engaged with enemy aircraft. During the height of the Battle of Britain I led 85 Squadron’s Hurricanes against the mass Luftwaffe attacks over the Thames estuary. On 18th August, I claimed an Me 110 and two Me 109’s. The next two weeks saw the fiercest fighting – of 20 pilots in 85 Squadron, 14 were shot down (two of them twice), some killed, some wounded. Fighter Command lost the greatest number of fighter pilots on August 31 st. 85 Squadron was bombed as we took off. I managed to shoot up an Me 110 and a 109 before collecting a head-on direct cannon strike from an Me 110. With my Hurricane screen starred, its centre tank shattered, and wounded myself in the foot, I baled out. After two weeks in hospital, I was able to walk on crutches, and re-assumed command of 85 Squadron. In September 85 Squadron was withdrawn from the front line, more or less decimated. I’d taken command of 85 Squadron in May 1940. I had learnt a lot in command of B Flight of 43 Squadron which was of considerable benefit when commanding 85 Squadron, which I led for more than a year – first as a day-fighter squadron through the Battle of Britain and then as a night-fighter squadron during the night blitz of London. 85 Squadron had a proud tradition going back to the First World war with pilots such as Billy Bishop and Micky Mannock, and continued its fine fighting tradition by acquitting itself well in World War II in France, Britain, and later in offensive night patrols over Germany. Based at Kirton-in-Lindsey 85 Squadron’s Hurricanes converted to night fighting, when bad weather caused serious problems. (Landing one night in dense fog I crashed, but escaped with bruises.) It was six months before we could claim our first night victory – a Dornier, its navigation lights on, which I destroyed one murky January night. We converted to radar-equipped Douglas Havocs in March, and in June 1941, I moved, as a Wing Commander, to Group H.Q. on the night fighter staff. There followed several squadron and station command positions throughout the remainder of 1941 and 1942, and in February 1943 I relinquished the post of Station Command at West Mailing, and joined training command. After commanding the Free French training wing in 1944 I was appointed Equerry to H.M. King George VI. As such I ended the war. Following his death in 1952 I was for a short period Comptroller to H.M. The Queen Mother. In July 1953 I was appointed Air Attache in Bruxelles, and in 1956 retired from the R.A.F. after 21 years service.